I want to talk about racism. And I don't. So I'm going to. 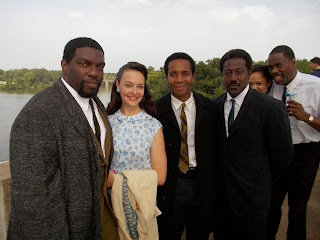 Seven months ago I got cast in the (now) award-winning film Selma. To say that after twenty years of an acting career that this was the pinnacle is the simplest way to put it. It was and still is a mountaintop experience. It has changed my life. But not in the ways you might think - I'm not getting calls from JJ Abrams asking me to play Alana Solo (sigh). That's OK. These changes are better. More important. So I'm going to try and share my experiences with you through this blog. Try and approach it piece by piece so that someday I can look back and remember all of this. But first, I need to talk about Being the White Girl. I need to talk about racism. A dear friend has been making a joke, at which our audiences are joyfully laughing night after night. And each time I cringe just a little. Here is the joke: "I'd like to introduce my co-star tonight, who is starring in the film Selma, which I'm sure you've all heard about - it's getting tons of great reviews and award noms... If you want to recognize her in the movie, she's the White Girl." Everyone laughs. I smile shyly. Afterwards I proudly take pictures and answer questions about the film, including the occasional "You don't play a racist, do you?" Thank God, I don't. I didn't have to say the "N" word. I don't think I could have, but I'm glad nobody asked. Because in the film it does get said. In the film Selma, a LOT gets said. Some of it is obvious. Some of it though... Some of it has been making me think. And I can't stop thinking. And part of me is REALLY uncomfortable with that. Because I'm the White Girl. And right now I see color EVERYWHERE. I can't stop seeing it. And I'm asking myself ALL THE TIME: Am I racist? Is what I'm thinking racist? Is this blog post... racist?? Part of me wants to stop seeing color, but I think that is part of our problem RIGHT NOW. I think I'm not the only white person who'd like to pretend racism is over - because 'I'M NOT RACIST'. If only I can shut my eyes hard enough, if only I can look every black person in the eye and not see black, then it's all done. Over. We can all "just get along." Gosh, that would be so much easier. Because in my heart I want more than anything for everyone... no matter what... not to suffer anymore. That's an easy thing to get on board with, right? But that's not reality. It will never be my reality again - at least not for a long long time. Because its still out there. Racism. I can't stop seeing it. And feeling responsible. And I HATE that. But I'm also glad for it. My self-awareness is SO uncomfortable. I wonder if every African-American I look at notices that I am paying extra close attention right now. I'm so sorry for that - I don't want to make anyone feel different or exposed or isolated or JUDGED. But I do want to CHANGE. I want to change ME, I want to change our COUNTRY. Because we as a nation haven't gotten it right yet. So I want to talk about racism. And I want you to talk about it. With me, with everyone. Because right now I know there are things I can do differently, there are things I can do better, so that, God Willing, SOMEDAY, I can close my eyes and rest. Knowing that it truly is over. Until then, I'll be uncomfortable. But at least I'll be awake. Tara...this is an amazing read. I need to sit and absorb before I can discuss but totally right on!!! Every week, I run by the King Center. It's on my basic route, about two miles or so in on the approach path. Up the hill, turn left, hear his voice boom over whatever's playing through my headphones, down the hill past Ebenezer, turn left. Every week. It's part of my environment. 1. When you talk about race, it's not the presence of race that I notice, it's the absence of it. The sameness. The division when I'm not home. When I hear what people say when they think they're being nice by skirting a few verbal land mines here or there, I cannot understand why they aren't the least bit curious why they think that way. Especially when I'm sitting across from them. 2. As much as I may feel we're poorer for not being around people who may not look or think or have the same experiences as everyone else, there is something immutable here: I am a middle-class white male from rural Mississippi. No matter what I do or how angry or frustrated I get, I still feel like I'm listening on the other side of the fence of this discussion. There isn't any easy answer. I really wish I could fix that. So, I have been in similar places to where you are a lot. I have been 'The Only White Guy' over and over and over again. Whether with Blacktop Circus or Rising Sage, I am almost used to it. I kind of have a routine just to show that I am a 'safe white person'. What people need to acknowledge is that many individuals are not racists or bigots and are not willfully prejudiced. However, many of us are sub-consciously prejudiced and not just about race. We're also prejudiced when it comes to class, and as Americans, as bad as we are at talking about race, we're worse at talking about social class. We're horrible at it and so we often conflagrate it with race, which is, in it's own way a bigoted and prejudiced act. The result is that the structures and common place social practices we have often put people of varying colors at a disadvantage. I also try to closely define what constitutes my white male privilege, and it's this: The systems we encounter are more likely to work the way they're supposed to for me than they are for my colleagues of color. It's not that I am getting something extra, it's that I am getting what I am supposed to get and they're less likely to receive that. My solution to that is to make it right where I can and to stand up where I think things are wrong. I try hard to not be rude about it, but I have found being friendly and quietly firm both helps me move my circumstances and those around me to sometimes peel back one more layer and get things moving. Tara ~ To not see color is to relegate a big part of someone's identity invisible. "Color blind," was an initial solution to racism. Since then, and as more people of different races have immigrated, it's become important to really see everyone - outside and in. The outside comes first no matter who your see; male, female, richly clothed, light, dark. It's getting beyond that is the trick. You are already more than halfway there, because you are educated and compassionate. That means you are capable of more learning. And by now you know that gated and sequestered communities don't ensure safety. They just keep people separated, with nothing in common and subsequently at odds with each other. I look forward to reading more of your work as I do seeing it. I noted Selma's end credits repeatedly misspell Liuzzo as "Luizzo" (once for Viola, once for Anthony). I also see no reference to this in several major-media pieces purporting to treat the film's faults, including NBC's, by a UVa media prof mentioning Liuzzo several times as one of the martyrs; and the Guardians, which says "the end credits are a bit naff" but doesn't say why or how. Have *you* rebuked or at all communicated with the producers about this careless, embarrassing error? P.S. Film credits are but an atto-niche in my files, but, like other atto-niches, have multiple notable cases. Stupid errors with names -- actors as well as the real or fictional people they play -- occur even in apparently "quality" screen-credits, showing inter alia that producers need some literate or at least sighted adults proofing their credits. E.g., in the Robin Wright-Naomi Watts flick "Perfect Mothers" (aka "Adore") -- a little piece of guilty-pleasure trash rather than important historical semi-documentary, but with very good-looking on-screen titles, and of course two very A-list stars -- the end credits, right at the top, actually reverse the names of the film's two (and sole) supporting actresses vis-à-vis their characters. A moment's Web glimpse shows people noticed that one... but not the repeated misspelling of the name of one of Selma's two very real "white martyrs." @markpowell - Unfortunately, end credits are a nasty beast, as any filmmaker will tell you. I've actually worked as a Deliverables coordinator on an indy film and had to sit for hours pouring over end credits triple-checking for mistakes. It's incredibly time-consuming. So when a film like Selma gets rushed distribution, things like credits fall through the cracks. The producers are very aware of the multitude of errors in the screening release of Selma, and the protocol to correct these errors is the same as it is for every film: the DVD release will have completely edited credit sequences, including Viola's name fix. It isn't an egregious snub, as the Liuzzo family themselves can attest to - even the most well-intentioned muck up the Liuzzo name ALL THE TIME. I'm smiling now thinking about a few instances when we were all together as their mom was being honored, and the speakers - every last one - fought and often failed to pronounce Liuzzo correctly. Her name is spelled correctly in the chyron graphic at the end - where it really matters, and where the filmmakers had much more control. Honoring our martyrs is a noble quest - but we need to keep perspective, which is hard to do in such an emotional context. Viola's memory has been resurrected in glory thanks to the film Selma. As a result of the film's national attention, her family is experiencing an embrace from their country 50 YEARS overdue. The gift that this film has given her legacy can not be overstated. To that end, human error is but a minor footnote, and easily corrected in the format which will truly retain her story.